In 2014 officers ran a check on my driver's license four times in four different states (Illinois, Indiana, Michigan and Colorado) for being a suspicious character on a bicycle. I can now add Alabama to that list--five down, forty-five to go. 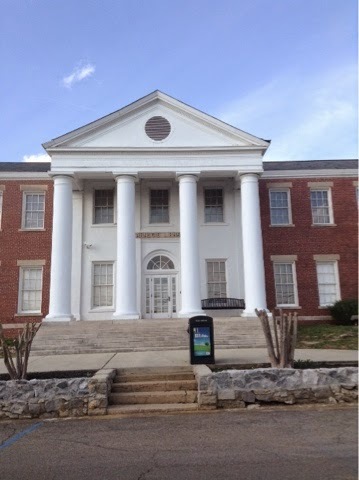 The latest incident happened on the campus of Alabama A & M after I asked a security guard the whereabouts of its former Carnegie Library. He told me it was just a couple blocks away, then asked if I had a pass to be on the campus. I did not. He wanted to know how I had gotten onto the campus, as all outsiders were required to have a pass. I could give him my precise route, as I had written it down, since I had to make a handful of turns to find the road the Carnegie was located on. He found it perplexing that I had come through one of the official entries. 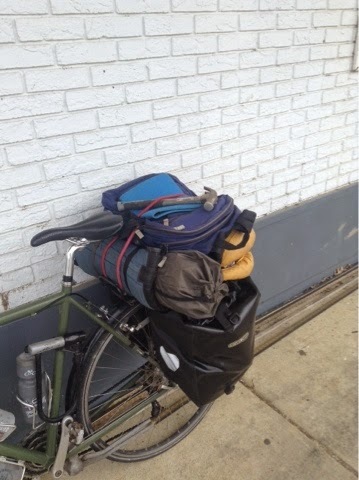 His suspicions might also have been raised by the hammer strapped atop the gear on the back of my bike, that I had just found along the road and hadn't found anyone to give it to. My color was a further object of alarm. as this was a predominantly black college. I hadn't seen a white and asked the officer if it was an all black college. He said, "Its a BHC--Black Historic College. The enrollment is 95% black, 3% Caucasian and 2% foreign students." He wanted to know what I was doing on the campus. Seeking out its former Carnegie Library wasn't an entirely plausible reason, especially since I had come all the way from Chicago. I told him of my quest and that I had already sought out three other Carnegies in the state. He didn't care to let me fulfill my nearly completed mission here without a look at my driver's license. It showed I was from Chicago, just as I had told him. A driver's license in the hands of a law officer is an opportunity to run a check on it, and he couldn't resist the opportunity, if only to prove to his superiors that he was on the job. He pulled out his two-way radio and said he had a "10-68," then read off my driver's license number. This was the first time an officer had done this in my presence, rather than in the privacy of his car. I was curious if I'd hear an alarm sound from the radio with the alert that this was indeed a suspicious character who had a lengthy record of being apprehended. Evidently the government doesn't keep such thorough records yet, and since I had no other marks against me, I was cleared. The officer asked how long I intended to remain on campus. "Just long enough for a photo. If you'd like to see the photos of the other Carnegie Libraries I have visited on this trip, I can show you. I have one of Decatur that I took earlier today?" "You came all the way from Decatur today on your bike? That's amazing. You go on about your business and have a nice day." The Carnegie was identified not only by a sign out front identifying it as "Carnegie Hall" (now a research center) but also by "Carnegie Library" still engraved above its entry. It was on a rise looking down upon the campus. 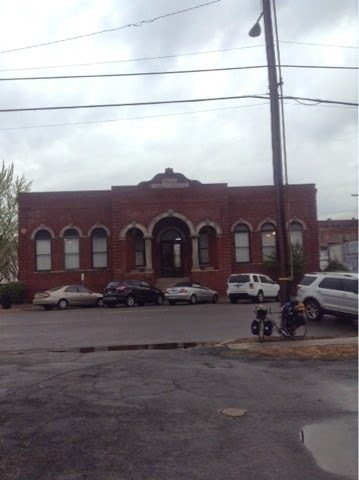 The smaller, but equally dignified Carnegie in Decatur also still carried its "Carnegie Library" label above its entry though a sign out front identified it as the "Carnegie Visual Arts Center." It was on a corner lot in a residential neighborhood two blocks from the old town center. It was unmarred by any additions. My route through the northeast quadrant of Alabama included another of the still standing Carnegies in Alabama. There had been nineteen of them, but only twelve remained. It was in Bessemer, a gritty steel town just south of Birmingham. 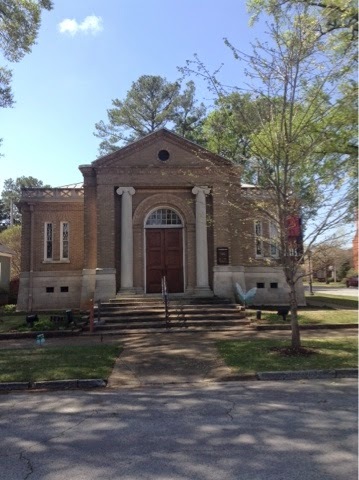 The library had been converted to the town's Chamber of Commerce in 1969. It had less of the grandeur common to most Carnegies, fitting in with the working class nature of Bessemer. .
My traveling companion Jim, who had grown up in Birmingham, was surprised to learn that there was a Carnegie in Bessemer, as he knew the town's character and also knew the usual magnificence of the Carnegies. An uncle of his had lived in Bessemer. He couldn't recall any building of a Carnegie nature from his visits there. Unfortunately, Jim was delayed in finding flowers to put on his mother's grave so didn't arrive at the Childersburg library by our agreed meeting time to join me on my detour to Bessemer. Our back-up rendezvous was at the hotel in Birmingham where Jim would be staying. It was right beside Beer World, a huge bar with over 500 beers to choose from, right where I found Jim. I didn't arrive until after dark. I could have camped in any number of forests outside of Bessemer and met up with Jim the next morning, but Jim planned on flying out of Birmingham to St. Louis to meet up with some friends from Chicago, and I was concerned he might have arranged an early morning flight, so I pushed on in the dark. There was minimal traffic and it was a pleasantly warm night, so I was delighted to be on my bike. Jim said he had decided to skip St. Louis and hang out in Birmingham the next day. That meant he could give me a tour of significant sites. The first was the apartment building around the corner from the hotel where he and Marshia had first lived. He was shocked that it had been torn down and was now a grass field awaiting development. He was also saddened to see his favorite hot dog cafe in a sliver of a building sandwiched between two highrises in the downtown was closed down and awaiting a new tenant. It was an institution dating to 1920. He also pointed out his dentist's office in a high rise that he used to look out from as his teeth were drilled and also the building where his mother used to work. Our meanderings took us by quite a few plaques commemorating Civil Rights marches in the early '60s. At the time Birmingham was known as the most segregated city in the US. Its population of 60% whites and 40% blacks were very much kept apart. Jim went to all white schools and had no black friends. Blacks had separate entrances to buildings and were barred from the city's parks. It was against the law for blacks and whites to even play checkers together. Martin Luther King led marches in the city. There were a number of marches of mostly children that the local authorities tried to thwart with dogs and high-powered jets of water. The extreme racist culture had even infected Jim at the time to join the hoards of whites who lined the streets taunting the blacks with the n-word as they marched. It is hard to imagine the Jim of today as such a person, but such was that era. He showed me the exact spot he stood as a college student during one of the marches. It was a block from the park where many of the marches originated, now known as Place of Reconciliation and Revolution. 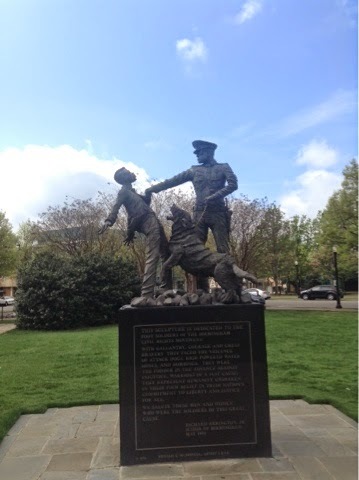 A statue of King stood at one corner and statues of children being attacked by dogs and other statues filled the square. 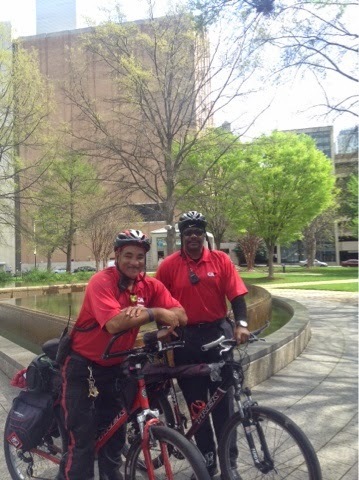 Also in the square were two cyclists who patrol the city to provide assistance to those in need. They can fix flat tires for cyclists or motorists and carry battery packs to jump start cars. They also look out for the homeless, directing them to agencies that can assist them. They are privately funded by the local business association. They brightened our day. As we cycled about, Jim marveled at the scarcity of people and how little traffic was on the streets. It was a stark contrast to his ride into the city the day before. The outlying areas were more clogged with traffic than he had ever seen. The downtown didn't seem to be in particular decline, but it wasn't thriving as in days of yore. As always, I felt privileged to be sharing this experience with Jim. It was a final superlative few hours after five days of travel with as sensitive and reflective of a friend as one could have. Beware of cyclists looking for Carnegies! Crazy world. Glad they let you carry on. Thanks George. This is rich. Surely that peace officer will be talking about you for a while to come. He'll never be quite the same. And no blacks in city parks? Wow...the bicycle helpers were the best. A new age of civility. Wow George. I have never been carded by a cop while bicycling in the USA. But you have so many more miles than I. Actually, the 'Bessemer Converter' was gradually made obsolete by 'open hearth' process commercialization which relied in part on use of scrap steel.